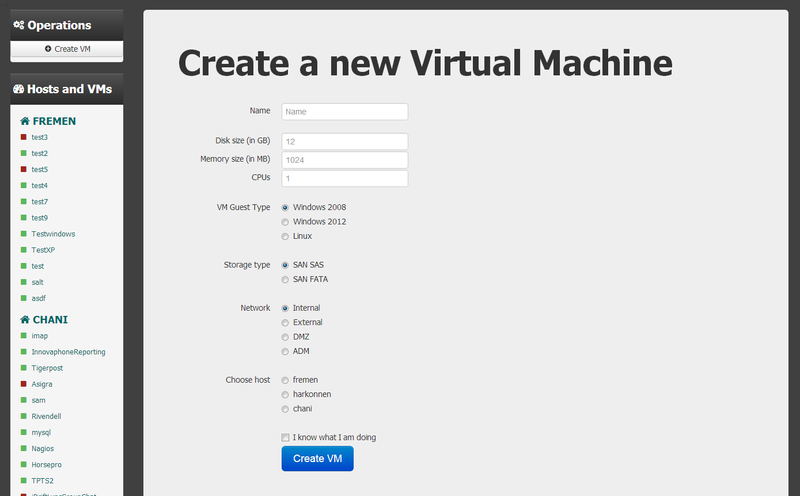 Virtualization! Sorry, I meant Cloud! is probably the right word to use in these times, and every sysadmin, sorry, I mean DEVOPS-guy needs to write their own cloud solution, right? This page will explain how I built my small virtulization cluster using different free software tools. There exists a bunch of different free software solutions in this space already, OpenStack, oVirt, Archipel, Proxmox Ganeti. Some of these are based on libvirt, some are not. Some have invented their own communcation bus/agents. Most of them assume full control over your stack. They have varying requirements of your storage solution. Varying degree of requirements of the management server. My motivation was something more loosely coupled, easy to install (relatively), extremely flexible, and few assumptions about your setup. This entire solution can be ran on a single host, or some parts of the solution on VMs inside a single host. Or split over several physical machines. The poing being, it has very few required parts and is flexible. 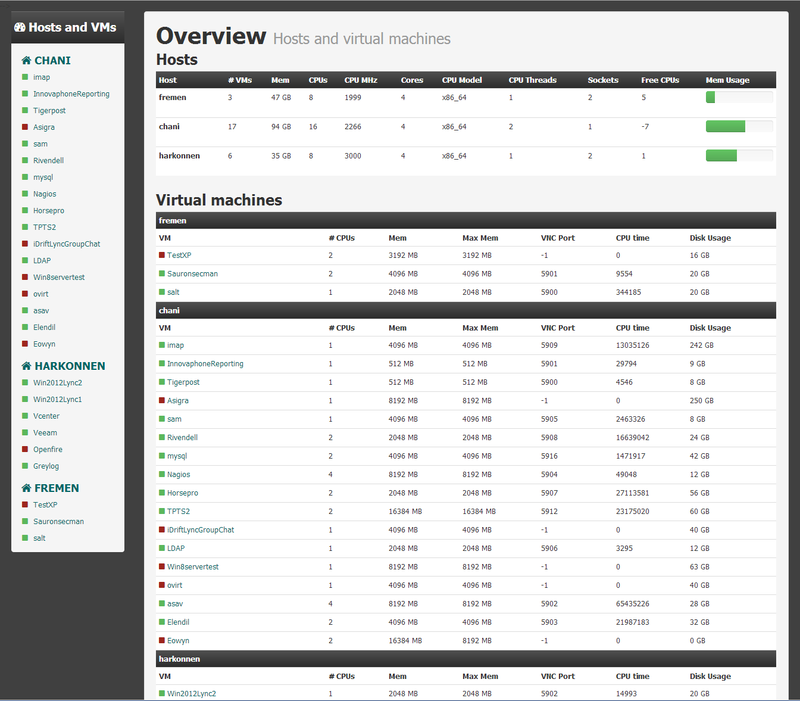 It's also meant to showcase the power of Salt combined with Salt API for builing neat interfaces on top of complex infrastructure The current featurelist is pretty short, it's basically just overview over hosts and VMs, simple VM control (console, start, stop). The most advanced feature is probably the drag & drop of a VM onto a host to do live migration of a VM The status of this is a the Proof of Concept stage, it's by no means any feature complete or mature contender to other solutions listed above. But I wanted to show that by relatively little effort one can build powerful solutions based on all the existing free software in this area by using Salt as the glue. PS! There are screenshots at the bottom! First, I skip ahead to after you have installed Ubuntu successfully. The next step is to install salt. I am not going to reiterate the instructions found at the salt documentation site The rest of this page assumes you already have a working master with the hosts as minions. 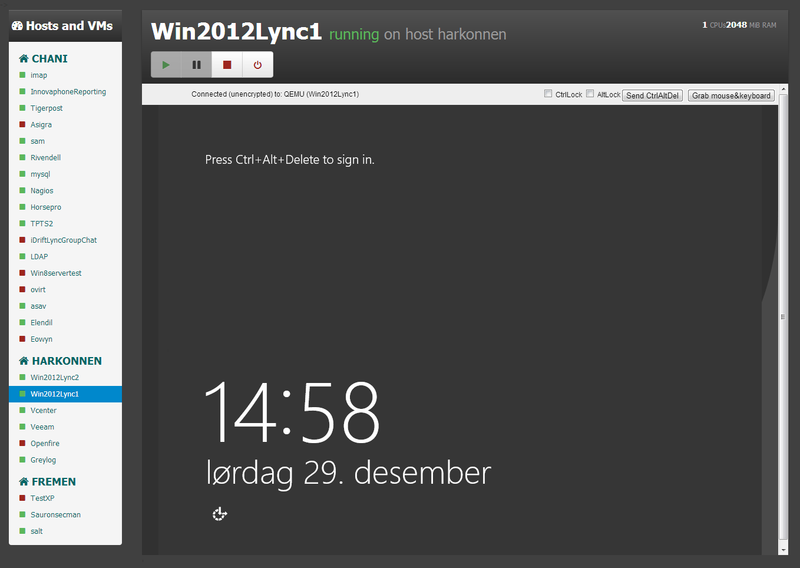 Then comes the state files for making the host a virt-host, and next the state file for cluster functionality. Clustering is required for using clvm which is a clusterd version of LVM. The CLVM is used to store the virtual machines on shared storage using Logical Volums as raw block devices, each guest gets one or more LV. If you don't have shared block storage, and for example use NFS or other storage instead, you can probably skip the cluster part. It can also be used a base for other cluster services as HA/GFS2/OCFS2/failover/etc. Here follows a listing of the state file for KVM functionality. It requires that you generate a ssh key that you put in the kvm state folder to be used for inter-host communication. If you are unfamiliar with salt states, these two states are Yaml files, with a little jinja templating logic. Salt reads these files and "pushes" the hosts into the desired state. Here follows a listing of the cluster state file. The SLS-files references a few configuration files, these can be found at my state github repository, along with the code for the webpage. That's all. Please contact if you have any comments, etc.